If there’s one thing that used to baffle me completely, it was heading tags. Well, there were a few things (like Facebook in general) but this was one that was particularly baffling. 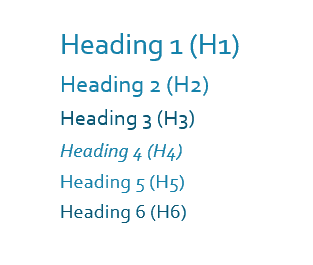 I knew what the headings were, I was used to seeing them on Word documents, but I hadn’t really understood the importance of them on the website. 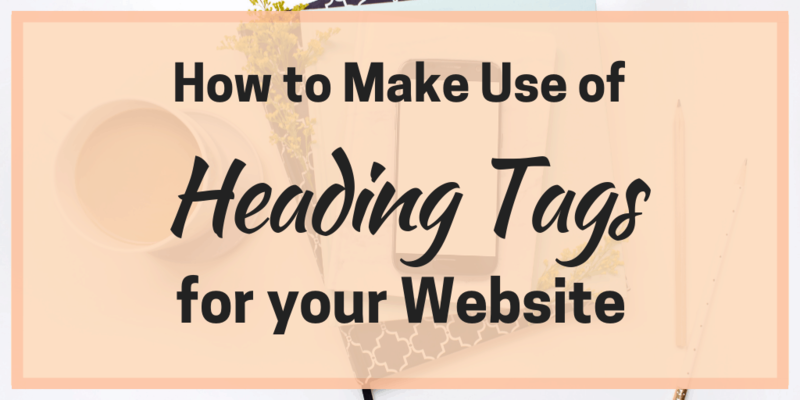 Now I understand a bit better so let’s chat about heading tags and how to use them. What are the 6 levels of heading tags? Heading tags or header tags is the names given to a designation of a piece of text that shows it is different to a normal block. A heading or subheading is a way to break up a piece of content and also has SEO benefits. 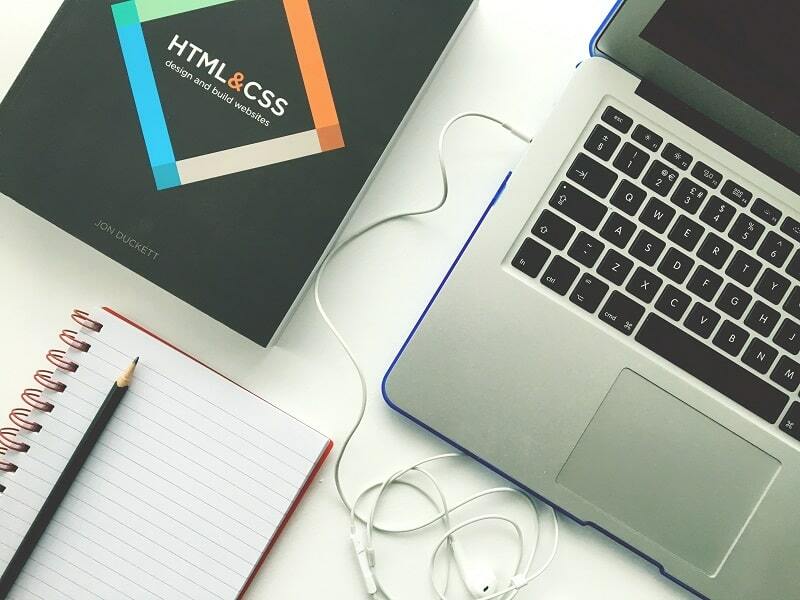 The heading tag is the way that it shows in the HTML code of the website to tell search engines and others which part of the content is for what. There are six levels of heading tags. The top is the H1 which is the usually shown as the largest and boldest version. H2 is next then H3 and so on. You can see an example of the difference from a standard Word doc below. It stands to reason that the H1 tag is the most important because it is top of the list, but it is interesting because it is also the one that is just used the once. The H1 tag definition means that it is used for the title of the post or the page. So the H1 for this post would be ‘How to Make Use of Heading Tags for Your Website’. The H1 tag is key in telling search engine bots that most core piece of information about the post or page – what the title is. The H1 should include the primary keywords and when you use WordPress, the title you give to the post or page automatically becomes the H1. Spot the H1 tag up near the top! Of all the tags, the one you probably use the most is the H2 tag. 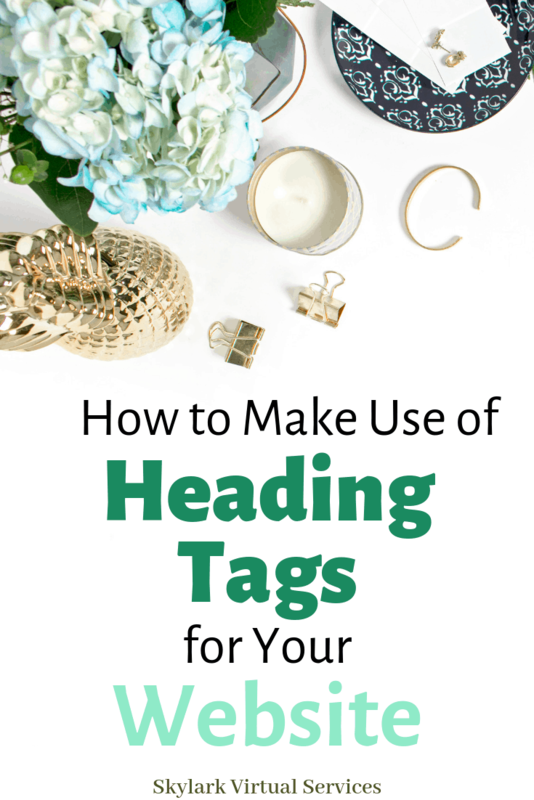 This heading tag is the one used to divide a blog post and is important both for SEO purposes and also to help make content easy to read. From an SEO viewpoint, H2 heading tags help to tell Google what that section of content is about – that’s why they should be relevant and use good keywords. Not everyone has to have the main keyword in it, that would look weird. But at least one of the H2 headings should contain the main keyword and it is good practice to have other keywords used in the piece as headers too. From a user experience viewpoint, most of us will scan a document and heading tags are a good way to help us see what bits we want to read. It also breaks up the document – pages full of content are great in fiction novels but not so great on a website. Think of your user’s eyes and help them out by breaking things up. There are other heading tags right down to an H6. I often use H3 when I want to break up a section, but it isn’t different enough to warrant a new H2 tag. So if you had two set of five tips you could have an H2 then five H3’s for the titles of the tips then another H2 and another set of five H3 tags for the second set. It breaks things up, makes it easy to scan and also adds SEO weight for search engine bots. Now we have met the different heading tags, let’s check a few best practices on how to use them in your blog posts in particular. As mentioned, each post or page should have one H1 then H2 and H3 tags as needed. People ask how many H2 tags per page but that’s a difficult one – it depends on the length of the content. But if you have Yoast installed, it will prompt you if you have a block of text more than 300 words without a header tag so there’s an idea. Heading tags are a bit like internet chapters. Rather than starting a new page each time, they break up the content into readable sections. This works when you consider that only around 16% of readers go through every word of an article – those chapter headings catch their attention and let them know at a glance what a section is about. We mentioned above that H1 and H2 tags are important for the structure of your site and to tell search engines about your content. In fact, all heading tags can help boost SEO a little if you use them right. Don’t just randomly add them in stuffed with keywords for no reason – use them strategically around the main keywords in your post. That way you can get some extra SEO juice from them. Now there’s no way to guarantee that Google will use your content as a featured snippet but if you use good heading tag practices, there’s a far greater chance than if you don’t. You will see some weird uses of heading tags out there, especially on sites that haven’t been updated much. 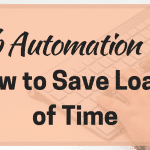 Have whole paragraphs in a heading tag is one example – sure it looks bold and a little different, but you can do that easily enough without using a heading. That’s not really what they are for! Another is adding extra H1 tags for things you want to emphasise like a call to action, a contact telephone number or other important information. Google has said it is okay, but this won’t make it any more important or liable to feature anywhere and just confuses those search engine bots. Is your content about heading tags or a phone number? Who knows, off to the next one! 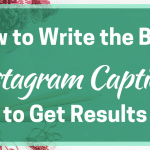 By styling your heading tags to look a little different to normal text, you can also add some of your brandings into your post. I use a different font and colour for headings than for normal text and this helps them to be scannable and to make things look nice. Don’t get too excited with different options but keep the system consistent across your whole website. 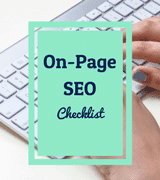 Want to get a simple checklist of On-Page SEO factors to help you make your posts more SEO friendly? 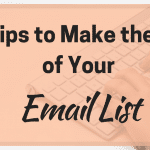 Sign up for my free newsletter and grab the checklist today! Thanks, Angela, for making that so easy to understand. It’s answered a couple of questions I’ve had. Thanks Susie, glad to help! I reading about tags today from various other blog posts! 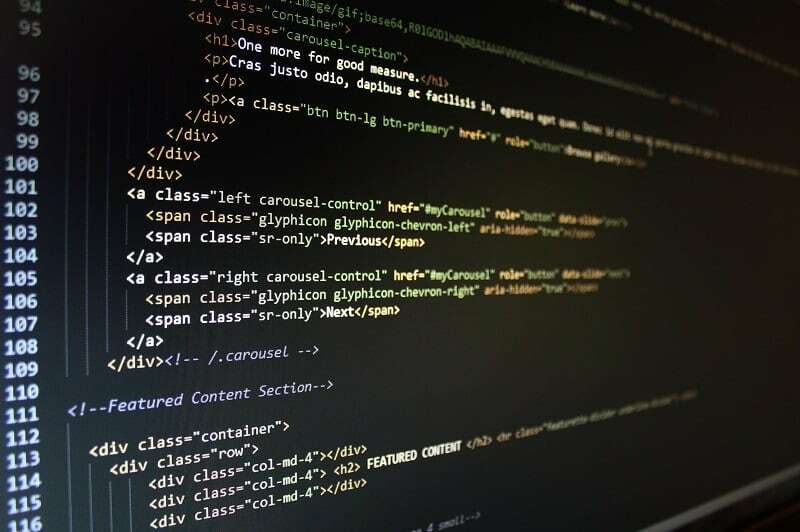 I am glad I came across your post because I was looking for more articles about header tags. Thank you for sharing! Thanks Lanae, glad to help!